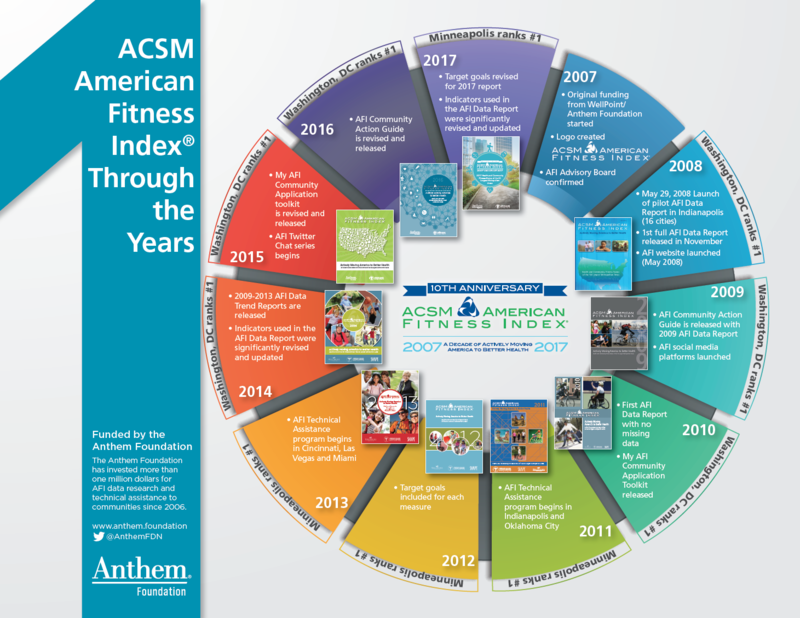 In 2017 the ACSM American Fitness Index celebrates it’s 10th anniversary. For the last decade, the Fitness Index has been recognized as an assessment and evaluation tool to educate community leaders on the importance of key indicators of physical activity. With the support of supplementary resources such as the Community Action Guide and My Community Application Toolkit, leaders can focus on policy, systems and environmental change strategies that are evidence-based and create sustainability for the community. Nationally, there have been noticeable long-term trends in the rankings that are both positive and negative. The positive trends include: smoking rates have declined two percent since the first rankings, more residents are biking and walking to work, and the number of farmers’ markets have increased. A few negative long-term trends have also become noticeable: the percent categorized as obese increased, the percent self-reporting as having excellent or very good health declined, and the percent of people diagnosed with asthma increased. The Fitness Index celebrates the efforts made to improve the health and wellness of residents and urges all communities to identify opportunities for improvement. For more information on highlights over the last 10 years, download the infographic below or details specific to your city can be found at www.americanfitnessindex.org/report/.